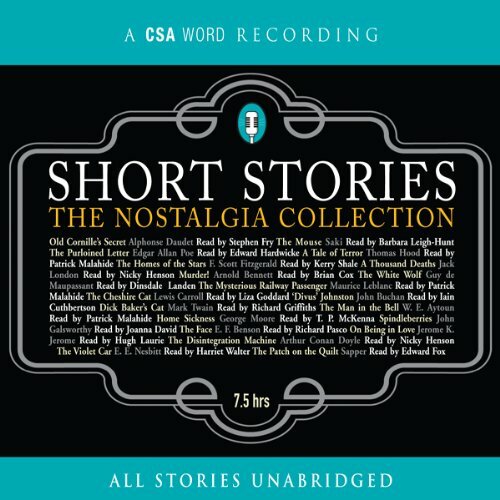 CSA Word continues its ever-popular series of classic short stories, featuring writers such as Jerome K. Jerome, Louisa May Alcott, and Saki, read by such respected and revered readers as Derek Jacobi, Hugh Laurie and Stephen Fry. I am surprised to find there is no table of contents or means of navigation. Surely this should easily be possible? Love all these collections. Great performances, good selections of stories that aren't basic tenets of high school that will call up bad memories. Very diverse and entertaining. Been listening to them while hiking on low volume so the bears don't get me. They have greatly improved tedious long trails. Also great just sitting in an armchair. 👏🏻 Bravo!!! Full standing ovation!! excellente sélection d'histoires racontées avec talent. pour tous les goûts et toutes les occasions. superbe! No... sometimes I could barely even hear them. One of them talked so fast I couldn't understand him. I never knew what the next story would be about. One seemed like an essay on being old and sour about love. I'm not sure it was even a story. The first story was the best one, then it was all down hill. sure but it's a lot easier to watch a movie than sit through a whole book. This wasn't a good selection of stories or narrators in my opinion. This is a collection of stories that have no appeal to my tastes. I found them dull and uninteresting. I only made it through 2 1/2 stories before giving up. Wish I could return it. This collection of Short Stories was really good to listen to. There is a good mix of amusing, funny, intriguing and darker stories aswell which makes for an audio book which is a pleasure to listen to without getting boring at all. The readers of each story are all very good, and also fit the stories they are telling well so that one feels that the readers fits with the story. very frustrating to listen to, no introduction to each story, no announcement of the author & most stories very thin, narrated by pompous BBC English voices.